Labyrinths Available for Walking in Alberta and elsewhere in Canada. The Difference Between a Labyrinth and a Maze | An 11-page illustrated paper on the Labyrinth (in PDF format). A printable 7-circuit labyrinth for "walking" with your finger when you can't get to one to walk. Our Mission is to promote the establishment and use of labyrinths as spiritual exercises. We encourage people to learn about the labyrinth and experience its powers for healing and spiritual growth. Through walking a labyrinth, we hope that you will experience the spiritual power of this rediscovered 12th Century mystical resource. Centre for Spiritual Living S.E. 7621-101 Ave.
hosts a labyrinth walk the first Friday of every month from 7:00 p.m. to 9:30 p.m.
and a labyrinth dance from 9:30 p.m. to 10:30 p.m. Walks are not held during the months of July and August. and is permanently placed on the sanctuary floor. Donations are gratefully accepted. St. Albert United Church at 20 Green Grove Dr. has a 7-circuit Chartres-style labyrinth painted in purple on a white 22-foot parachute. It is avaiable for walking on the last Friday of every month 7:00 -9:00. Call 780-458-8355 during a weekday to confirm. They also have an outdoor grass and brick labyrinth. A Chartres (11-circuit) labyrinth has been painted in lavender on an olive drab 39ft diameter nylon parachute by folks at Southminster-Steinhauer United Church. You can see something of what it is like in this photo. 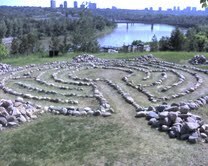 If you are interested in renting the labyrinth and/or having a talk on labyrinths, please call Charles at 780-436-8774 or email him. Riverdale Quarterly Walks - Sheryl Ackerman and Jean Ure set up a cloth Minoan labyrinth for walking periodically in Riverdale Community Hall, 9231-100 Avenue. 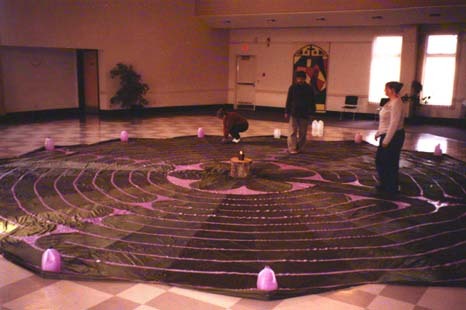 It is a 7-circuit, Crete-style labyrinth made with golden beads on purple broadcloth that is 36 feet square. The usual months are January, April, July and October on a Saturday from 11 am until 2:00 pm. Open to all. Donation of $5-$10 appreciated to pay for hall rental. For more information call Sheryl at 424-6889 or Jean at 424-8339. Louise McKinney Riverfront Park between the Shaw Convention Centre and the river. It is east of the Shaw Convention Center and south of the main parking lot. It is an aboriginal "Turtle Rock Effigy" labyrinth installed for The Works art festival some years ago. Complete with a stunning river valley view, it is especially pleasant at sunset. Southminster-Steinhauer United Church has created an outdoor labyrinth north of its parking lot on 19th Avenue near 108 Street. Providence Renewal Centre has an outdoor labyrinth behind its main building at 3005 - 119 Street. Riverdale Community has an outdoor 8-circuit Minoan labyrinth at Riverdale Elementary School, 8901 - 101 Ave.
Belgravia Community has a 7-circuit outdoor labyrinth constructed of gray blocks with a grass path in the southeast corner of the Arts Park, 73 Avenue at 115 Street. St. Andrew's United Church in Spruce Grove has a large outdoor, 11 circuit, Chartres-style labyrinth on the east side of their building at 1A Fieldstone Drive. St. Albert United Church at 20 Green Grove Dr. has an outdoor grass and brick labyrinth. will unfold, what the outcome may be. after the other. All we need do is keep on going. the next step to see where it takes us. can take our own time, move at our own pace. The only race we´re in is the human one. our spirits greet each other as we meet on the path. In the labyrinth, we move in circles, but are not lost. to a place where all becomes clear. as we continue to place one foot in front of the other. * © Shirley A. Serviss used with permission. Contact her to reproduce this poem. Another poem from a walker of the Riverdale Labyrinth in Edmonton is here in an MSWord document. If you know of labyrinths in Alberta that we have not listed below, please email us the details for posting here. Bonnyville - private outdoor labyrinths of several designs. Access: call Kevin at 780-826-5746 to arrange a walk. Grande Prairie - St. Paul's United Church has an 11-circuit, Chartres-style labyrinth painted on the floor in the basement. Special dates and walks offered, contact the churh office for more information - 780-532-2415. Donelda Laing 780-539-7263 in G.P. 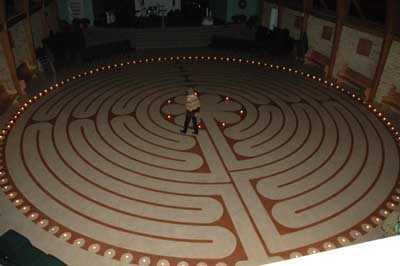 offers workshops and special occasion walks on a portable 11-circuit, Chartres-style labyrinth of 36 ft in diameter. South of Grande Prairie - There is an outdoor, open to the public chartres labyrith on highway 40 at camp Tamarack (5 minutes past the city limits). There is no sign directing folks to the labyrinth once you arrive in Camp Tamarack parking lot, but there is a baseball diamond and a paved trail that heads east. Walk down the trail and you will come to the labyrinth in about 6 minutes. Grande Cache, has an 11-circuit, 70-foot medieval outdoor labyrinth made of rock. Entering Grande Cache turn south (left if coming from Hinton and right if coming from Grande Prairie), onto Hoppe Avenue. Turn left on 104 St. and continue on as it turns into a gravel road, approximately150 feet from the pavement. A sign "Grande Cache Labyrinth Park" marks the entrance. The labyrinth is always open. McDougall United Church - There is a Minoan labyrinth (unicursal, 7-circuit, painted on the floor) in the lower hall at McDougall United Church, 10086 McDonald Drive, Edmonton, which may be available. Call the office between 9:00AM and 4:00PM at 428-1818.
between 10-12 & 1-3 weekdays. Allen Gray Continuing Care Centre, 5005 - 28 Avenue in Millwoods, has a labyrinth permanently placed on the floor of their lower level. Call 469-2371 to confirm access times. University Hospital - on the 4th floor, in the east atrium, there is a 7-circuit chartres labyrinth inlaid in the carpet. It is available at any time, but you may have to move a table and a few chairs to the side because folks who eat their brown bag meals there sometimes move tables and chairs out onto the labyrinth area of the carpet. There is a sign to coach you on walking a labyrith and another describing what a labyrinth is. There is an outdoor labyrinth in West Stettler Park. Sunnybrook United Church - Visit the outdoor "Chartres" labyrinth in the north-east quadrant of the grounds of Sunnybrook United Church, south of 32nd Street East, off Springfield Street (across from the fire station) and at 12 Stanton Street (403-347-6073). Gaetz Memorial United Church - Walk the indoor "Chartres" labyrinth painted on the floor of the fellowship hall of Gaetz Memorial, 4758 50th Street. Call for times when it is available 403-347-2244. Meridian Beach, Gull Lake - 7-circuit of sandstones. Access to Meridian Beach is generally via Highway 2. Gull Lake is to the west bordered by Highway 12 on the south and Highway 53 on the north. Paved secondary highway 792 runs north-south up the east side of the lake. Meridian Beach is accessed by turning west off Highway 792 at the Meadowbrook Church and traveling 6.6 km west on Township Road 422 and the turn south at the Meridian Beach sign. Park at the Community Hall and walk west over the foot bridge towards the lake. The Labyrinth is located south of the beach near the shore of the lake. The beach is open to the public seven days a week between 6 AM and 8 PM. FCJ Christian Life Centre has an outdoor garden labyrinth at 219 - 19 Av SW. Call 403-228-4215. It is a 7-circuit Classic labyrinth about 50 feet in diameter, suitable for large groups and /or wheelchair accessibility. Knox United Church, 506 4 St. SW - Labyrinth Self-Guided walk. The Labyrinth is open Monday-Friday 9:00am-6:00pm for personal walking meditation; for workshops please call 266-6450. Take this opportunity to explore this ancient, yet modern tool for spiritual growth. Nurture your spiritual journey and walk this pilgrimage with other pilgrims who have walked this path since the Middle Ages. This is a 7-circuit Chartres design painted in period colours on the hardwood floor of the Labyrinth Room. has a Chartres-type labyrinth on their floor for weekday walking [Monday 9 a.m.-3:30 p.m. (closed over lunch) , Tuesday mornings 9:00-noon; Wed-Friday 9 a.m.-3:30 p.m. (closed over lunch). For additional workshops/walks and facilitated evenings once a month, please check our website - www.highriverunitedchurch.org or contact the church office at 1-403-652-3168.
has a Chartres-type labyrinth design painted on the basement floor. This labyrinth is available for scheduled walks and special events. Email Dianne King for more details and access time. Turner Valley is in the foothills of the Rockies, a 40-minute drive west of Calgary. phone: (403) 328-2703 to make arrangements to walk it. Southminster United Church, 1011 Fourth Avenue South, has a labyrinth. Call (403) 327-3404 or (403)327-5294 for information on when it is available for walking. Finger and Outdoor Labyrinth construction consultants are in Carbon, AB. Again, again we come and go, changed, changing. Hands join, unjoin in love and fear, grief and joy. The circles turn, each giving into each, into all. Wendell Berry, from "Song (4)", Collected Poems, 1957-1982 (New York North Point Press, 1984) p. 264. If you know of labyrinths in Canada that we have not listed below, please email us the details for posting here. In British Columbia: St. Paul's Anglican Church in Vancouver and the Xenia Creative Development Centre, RR 1 N-59 Bowen Island, BC has one indoors and one outdoors and there are labyrinths elsewhere in BC. In Saskatchewan: Prairie View south of Saskatoon, and at Two Spirit Ranch near Regina and Buffalo Stone Labyrinth Bed and Breakfast near Glentworth, south west of Assiniboia. Chesterfield - near Eatonia - R.M. of Chesterfield No. 261 there is a 600ft circumference 7-circuit Minoan style labyrinth on farmland from May to October or snow. Call 403-565-2288 to confirm availability. Opening Sunday May 3, 2014 at 12pm to meet and greet then walk at 1pm and hotdog roast to follow. In Manitoba, there is a Manitoba Labyrinth Network with lists of indoor and outdoor labyriths available for walking. The Carol Shields Memorial Labyrinth in Winnipeg is constructed in the Minoan form. In Ontario, there is the Labyrinth Community Network which contains a Directory of Ontario Labyrinths - public and private, listed alphabetically by owner name. To locate one near you, click on "A" and search (Edit-Find in This Page) for the major city closest to you; repeat for "J", and "R" - the three directory screens. St. Thomas has an outdoor garden labyrinth at Waterworks Park, on South Edgeware Street. In Toronto, West Hill United Church has an outdoor labyrinth always available. For a complete listing of labyrinths world-wide click here. Labyrinths are ancient devices used in many cultures to bring about a transformation in consciousness. As a symbolic tool, it represented the feminine aspect of the divine, worshipped in ancient times as the birther and giver of life. Its emergence in our time is serving as a bridge in the culture between established institutional practices and those elements that have been lost, most notably the use of the body in worship, a veneration of the feminine, and an intimate relationship betwween the spirit world and the land. In all cultures, the labyrinth represents the three-fold path of nature, that of Life, Death and Rebirth. Following such a pattern is a dance that engages us on a cellular level, returning us to a felt sense of the body walking the path of life. It is a pattern to be experienced and encountered as we seek wholeness in an increasingly fragmented world. Poitiers Cathedral - organic curved path which reaches a fork at the centre; taking either fork will bring you back to the centre and then back out (unless you take the other fork which will also bring you back to the cental 3-way intersection). This one at Poitiers is a drawing on the wall, not a walkable one on the floor. Abbey of Sainte Bertin, Sainte-Omer - square with rectangular path with too many twists to round circuits. Joanne Graham, 780-453-6775 or 780-266-1449(cell), offers a 2-3 hour workshop which includes a talk, a walk on her portable 5-circuit labyrinth which is 14ft square, and making a fabric finger labyrinth to take home. Eva Nolan, provides a portable labyrinth along with an introductory talk and walking opportunity. Her Chartres design, 11-circuit, rainbow labyrinth is on a single piece of canvas 24ft wide; it weighs 25lbs and can be shipped. Labyrinthos - Caerdroia's Labyrinth Site in the UK. Simple finger labyrinth to trace on screen or print off. Drawing a Minoan 7-circuit one in chalk on concrete or in turf paint in a lawn or playground. The lawn version can then be mowed to make it last beyond a rain storm. Step-by-step procedure for drawing of a unicursal 7-circuit labyrinth. Making a Chartres 11-circuit labyrinth using tape on a floor. You can make a smaller 7-circuit Chartres-type labyrinth. (but you could paint one on canvas). and there is no need to paint it as this one is coloured. Wooden "Finger" Labyrinth Boards (Chartres pattern) from Gilbert Giesbrecht in Carbon, AB, Canada. Call 403-572-3545. Labyrinth Enterprises made-to-order and in-stock labyrinths from the US. Our Photo Album - Show me the pictures. This site was created by and is maintained by Charles Bidwell.